An Artist Imagines The White House As It Once Was When presidents move into the White House, they do what any new homeowner would do: they redecorate. The White House Historical Association has commissioned 14 paintings that explore what the residence looked like in its first 100 years. In 1837, President Andrew Jackson invited guests to the White House to eat a 1,400-lb round of cheese, which he'd been given as a gift. It was devoured in just two hours. Peter Waddell imagines the scene at the end of the party in The Great Cheese: Jacksonian Democracy Enjoys a Special Treat. Click here to explore the painting. The White House is a home, not a museum, so when presidents move in, they do what any new homeowner would do: they redecorate. Just like the rest of us, they paint, paper, change the furniture and carpets. In 1860, President James Buchanan welcomed a delegation of three Japanese samurai. They noted that the White House lacked towers and a moat, but conceded it was "handsomely furnished." 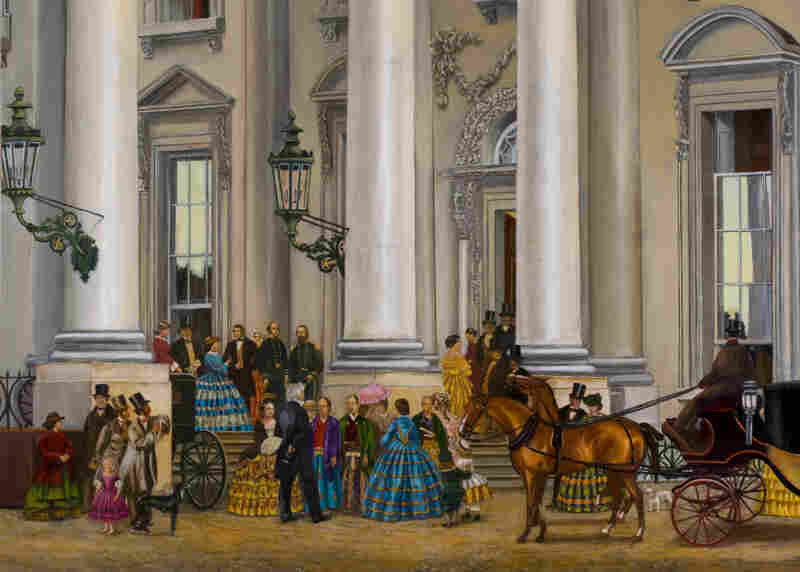 You, too, can see inside the White House as it looked in its first 200 years in an interactive at the White House Historical Association website. The White House has been "done over" many times, and now, the White House Historical Association has commissioned a set of pictures to explore what those famous rooms might have looked like at different moments in American history. The exhibit of 14 paintings by architectural painter Peter Waddell covers roughly the first 100 years of the White House, from 1792 to 1902. "Few artists painted [the White House]," Waddell tells NPR's Linda Wertheimer. "It's a really hard building to paint decently. Compared with how ... many images there are of Mount Vernon, there's very few of the White House." But, Waddell says, the interiors were even more complicated. Working with The White House Historical Association, Waddell looked at inventories, samples of fabrics, and furniture and fixtures still stored in the White House collection, to get the details exactly right: "We know how many yards of trim for the curtains," he says. "We know about the white sheer curtains with the little eagles on them. We know the colors of things." Grover Cleveland, the only President to get married in the White House, married 21-year-old Frances Folsom, above, in the Blue Room in 1886. The blue furniture, as shown in Waddell's painting, Something Blue, is still in the White House collection. Click here to explore the painting. The sheers were in the East Room of the White House as it may have looked in 1837, when Andrew Jackson was president. Today, the room is used for large gatherings and for White House news conferences. But Jackson may have been the first President to really use it. "Until Jackson, it really hadn't been used at all," Waddell explains. "It wasn't decorated." But that didn't last. Waddell's painting (above) depicts an opulently decorated East Room — full of gold and tea and brocade. By today's sensibilities it looks overdone, but Waddell says that at the time, "gaudy was good. ... Bright color, shining surfaces were things that people craved in a time when the outside world was covered in dust and ground-up horse poo and, in winter, mud. I think when you went inside you wanted to be dazzled. ... If you wanted Earth tones, you could go outside for it." 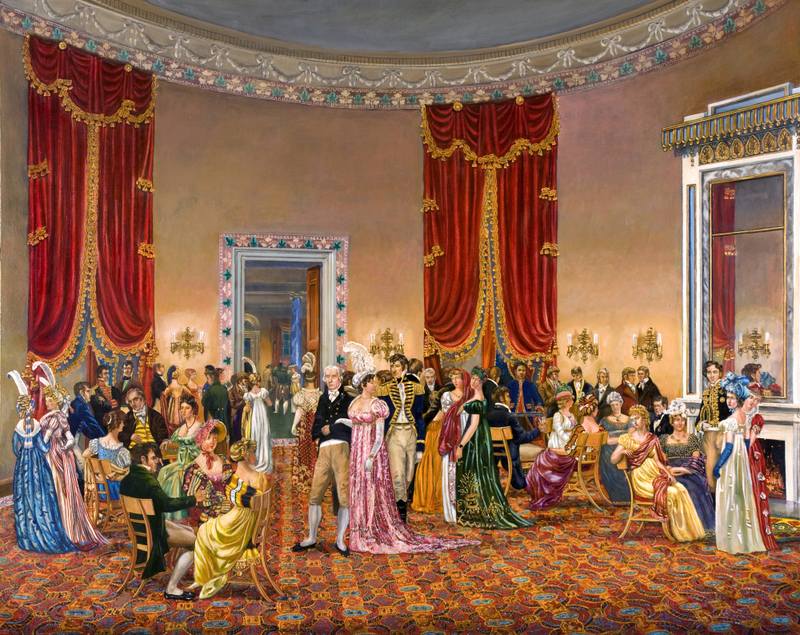 Another one of Wadell's richly detailed paintings, The Splendid Mrs. Madison, depicts a party circa 1810, given in what was then called the Elliptical Saloon. Today, we know it as the Blue Room — but it wasn't blue yet. 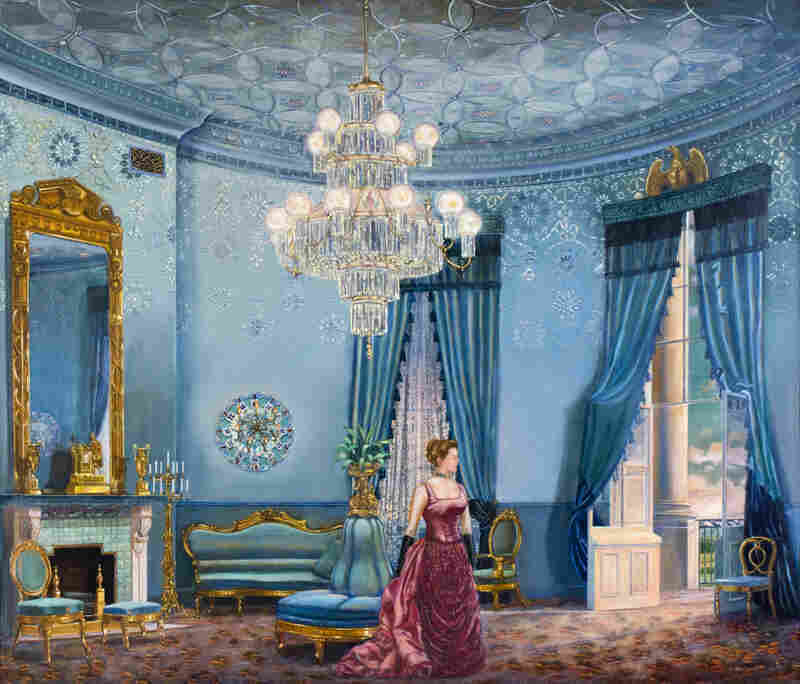 In The Splendid Mrs. Madison, Waddell depicts First Lady Dolley Madison's drawing room, circa 1810–1814. Benjamin H. Latrobe designed the space — but wasn't happy with the curtains: "Oh the terrible velvet curtains!" he wrote. "Their effect will ruin me entirely so brilliant they will be." Click here to explore the painting. When First Lady Dolley Madison held gatherings in the lavishly decorated space, the room was "the color of candlelight," Waddell says. Curtains were hung all around the room — not only over the windows, "so that it appeared that the fenestration went right round the room. It was like being in a merry-go-round almost." The Madisons appear in the center of the painting — the First Lady is decked out in jewels that Waddell painted based on a firsthand account. Another painting in the collection shows the Red Room in 1883, which was already red but very differently decorated — and with a surprising view of the Potomac River out the window. It's been many years since the river could be seen from the White House. "When I first went to the White House, I thought that must be how it always was, Waddell says. "It was a big shock to discover that how you see it now is quite recent. It wasn't a museum. It was just a house that was endlessly redecorated."